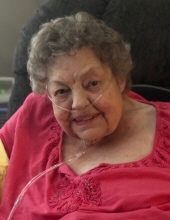 Mary Ellen Hughes, 91, of Farlington, died at 1:15 a.m., Thursday, April 11, 2019 in the Arma Health and Rehabilitation Center in Arma. She was a resident at WestRidge Retirement Community in Girard since June of 2016. Mary was born September 9, 1927 in Farlington, a daughter of Elmer Lee and Iva Mae (Matlock) Hill. She grew up and attended school in Farlington before moving to Seattle, Washington, where she worked on a ferryboat and restoring ships that were damaged or sunk during Pearl Harbor. She married William Robert Hughes in 1948 at Seattle. They divorced. Mary returned to Farlington in 1954. She worked as an office clerk at the Girard Hospital before retiring in 1996. Mary married Frank Enke in 1971 and they later divorced. His three daughters are Connie Clugston, Deanna Hill and Kathy Nelson. Mary was close to Kathy and Kathy participated in her care the past few years. She was a member of the United Methodist Church in Farlington. Mary was a serious Domino player. She enjoyed her family, the time she spent with her grandchildren, playing Bingo, cooking, and cake making. Mary was blessed with two sets of twins, Robert “Bob” Hughes, and his wife, Julia, of Neosho, Missouri and Sharon Doebelin, and her husband, Curtis, of Mexico, Missouri; James Hughes, and his wife, Karen, of Lake Ozark, Missouri and Becky Halsey, and her husband, Jim, of Fort Scott; a daughter, Marcia Sue O’Neal, and her husband, Dan, of Wakefield, Kansas; 7 grandchildren; 19 great-grandchildren: 2 great-great-grandchildren; a brother, Jerry Hill, and his wife, Bunleng, of Burlingame, Kansas; a niece and caregiver, Joyce Purdon of Frontenac. Mary was preceded in death by her brothers, Harold Hill and Eldon Hill; and her sisters, Irene Marsh and Joan Villamaria; a granddaughter, Katie Bowersock; a great-grandson, Brenden Doebelin. Funeral services will be at 1:30 p.m., Sunday, April 14, 2019 in the United Methodist Church in Girard with Reverend Dallas Peterson officiating. Burial will be in the Farlington Cemetery. Friends may call from 2:00 until 8:00 p.m., Saturday at the Smith-Carson-Wall Funeral Home in Girard. Memorials are suggested to the United Methodist Church in Farlington and these may be left at the church or the Smith-Carson-Wall, 518 W St. John, Box 258, Girard, 66743. To send flowers or a remembrance gift to the family of Mary Ellen Hughes, please visit our Tribute Store. "Email Address" would like to share the life celebration of Mary Ellen Hughes. Click on the "link" to go to share a favorite memory or leave a condolence message for the family.